wax paper for a 1” overhang on either side. Add almonds and mini marshmallows and stir to combine. Pour mixture into pan. Use spatula to smooth top. Leave bare or sprinkle with 1/4 cup finely chopped almonds as in the photo above. Chill for 10 minutes until chocolate becomes solid. Lift whole bark out of pan by holding onto parchment or waxed overhang. Split bark into pieces with a fork. Photo and Recipe above credited to Bakers Royale. My adapted recipe below, I decided to add a cup of dried cranberries for a touch of Christmas spirit. I increased the chocolate to 400grams to compensate. 1. Gather ingredients as in recipe above. 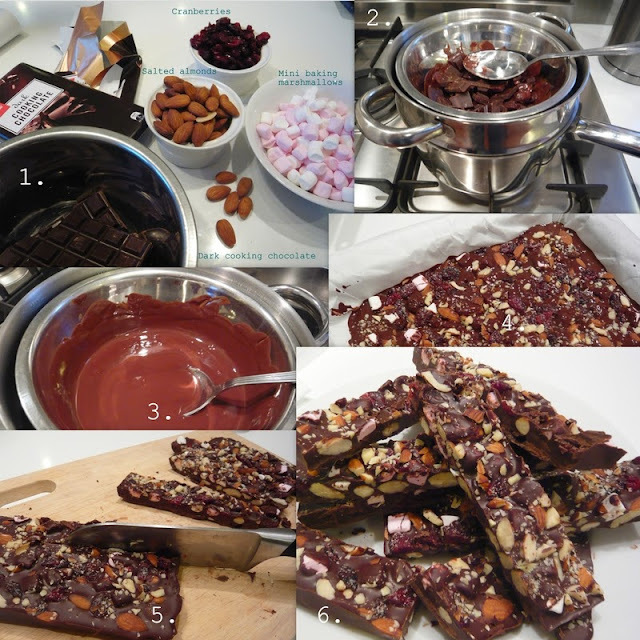 I used 2 x 200gm bars of cooking chocolate to compensate for the addition of a cup of dried cranberries. You could use milk chocolate if dark is not your favourite. Save a few of the salted almonds to crush for topping to add texture. I put them into a plastic bag and roughly crushed them with a rolling pin. 2. Break the chocolate up and put in a stainless steel bowl. I then sat the bowl in a steamer over a saucepan of boiled water turned down to simmer. 3. Stir the broken chocolate until fully melted then remove and allow to cool for 5 minutes. 4. Add your almonds (whole), mini baking marshmallows and dried cranberries, stir and pour into the prepared tray as in instructions in recipe above. 5. Allow about half an hour to set then turn out as instructions above. I sliced with a knife as I had made it a little too thick to use a fork. I recommend you spread it very thin to make the bark as it should be. I think I could have used 2 smaller tins and made it thinner. 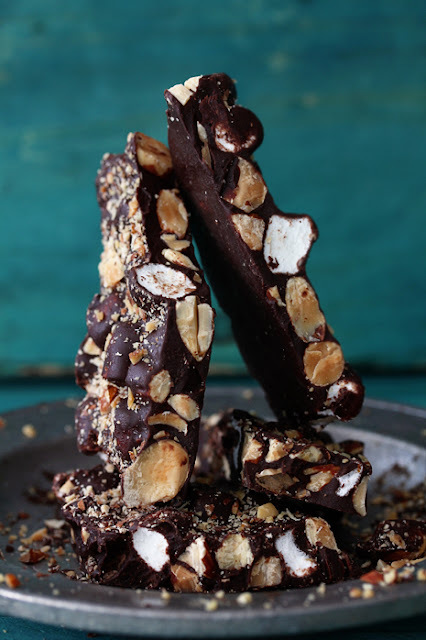 However, it was delicious as the chocolate melted in your mouth leaving you with crunchy, salty almonds and sweet cranberries. 6. You could place some pieces in a cellophane bag and tie with a nice Christmas ribbon. I chopped my pieces smaller and intend to present as a hostess gift when invited to friends places over the holiday period...hint...hint my NZ friends :). My Rocky road bark version with a "cranberry" twist! 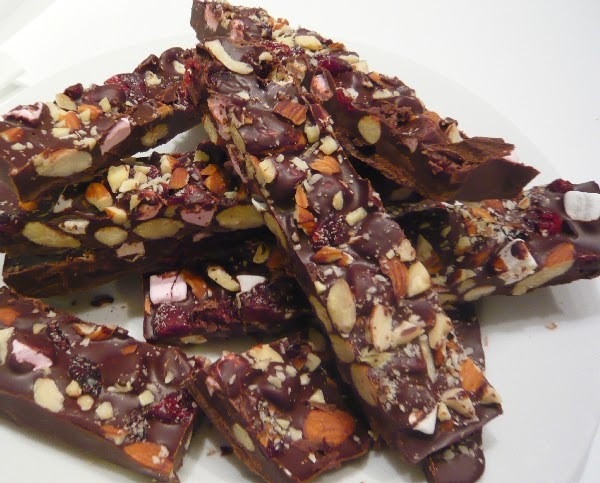 the Rocky Road Bark!....hope you had a great weekend. I would love to link up, its absolutely delicious. I will try to link now.